4 | 86 students enrolled. Certification in Online Derivatives Demystified course is jointly certified by NSE Academy & Elearnmarkets (NSE Academy is a subsidiary of National Stock Exchange of India). Derivatives are known to be among the most powerful financial instruments. Certification in Online Derivatives Demystified not only provides insights into meaning of derivatives, basics of derivatives, options futures and other derivatives, application of derivatives, but also prepares an individual for a career in the fascinating world of trading financial assets as well as train them how to make money trading derivatives,. This programme will constantly help learners with strategies for equity and derivatives investment and provide knowledge for trading, hedging and arbitrage opportunities. These opportunities can give rise to handsome profits as well as challenges because there are some important differences between investments in the cash market as opposed to that in derivatives. 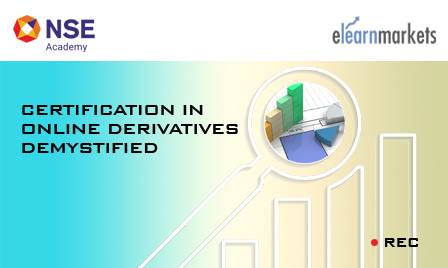 This course is a perfect choice to understand the complexities of the world of derivatives. Certification in Online Derivatives Demystified is essential for everyone who operates in the financial markets or within the corporate environment to understand the important financial instruments. This course will help them know how to make money trading derivatives. A sound understanding of Derivatives aids to hedge risk in the underlying, create Option ability, provide leverage, speculate as well as switch asset allocation. Students enrolling for this programme will be given a “Certificate of Participation” from NSE Academy facilitated by Elearnmarkets.com, after successful completion of the course. He shall also be given free access to related webinars conducted by Kredent Academy for further knowledge enhancement. An email query support, Question & Answer community platform will also be availed by the student for any kind of doubt clearance related to content while pursuing the course. Students shall get access to Interactive Learning Tools to have an in-depth understanding, strategizing and practice futures and options. All the knowledge content is provided by Kredent Academy from the platform of Elearnmarkets. Certification in Online Derivatives Demystified is useful for Students, Investors, Traders,Employees, Sub Brokers and all people who are interested to learn about equity derivatives. This is an online examination hosted on the website of Elearnmarkets.com. Note: The certification test can be appeared by the candidate only once. Pattern of questions: 50 multiple choice based question of 2 marks each. Qualifying marks: 50% , No negative marking for this course. Certificate: Once the participant successfully clears the examination, he/she can download the certificate from "My Certificates" tab available on their Elearnmarkets dashboard within 10 days from the date of Certificate application done successfully.